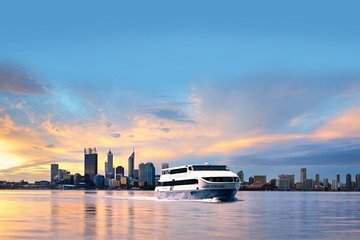 Spend an evening on the Swan River during this Perth dinner cruise that highlights the beauty of the city from the water. As you glide past the downtown riverfront and surrounding suburbs, admire twinkling lights reflecting on the water, listen to live music and dine on a buffet of roast beef, prawns, lasagna and more. Australian wine, beer, soft drinks, coffee and tea are provided, and you can purchase spirits from the bar. Your cruise starts in central Perth, where you’ll board your boat and take off down the Swan River, which winds past the city center and Perth’s upscale riverfront suburbs. Grab a glass of wine, beer or soft drink, provided throughout your cruise, and admire the twilight views of the city. Dinner includes a buffet of hot and cold dishes, from roast beef to lasagna to king prawns. Salads, bread, dessert, coffee and tea accompany your meal. Live piano music provides an elegant atmosphere during the evening, and on Saturday night cruises, DJ music is included. Surprise entertainment may also be in store! Great dinner cruise, basic but tasty food and good music. Loved the night views of Perth. We had a lot of fun on this cruise. Food was pretty good but being Vegetarian I was somewhat limited. Desserts were bit of a disappointment. Service was great. Good friendly, attentive staff. Entertainment was great - dance floor with a DJ and good dancing music. Was nice being out on the river at night time. Main criticism - For the price I think it should go longer - a lot of money to be home by 10.30!!! The trip was great and we enjoyed it. It is lovely to see your city differently, from the water. We actually didn't see the point of the DJ. An Ipod shuffling through the music would have sufficed. We wondered about the wisdom of allowing smokers out on the front of the boat, as this was clearly the premium view. We don't smoke and it ruined out trip out the front for us. Excellent and very enjoyable night. Food was great and the service very good, could not fault it. The views from the boat were really great. Would recommend this to anyone going to Perth. Victoria the entertainer on the cruise was excellent ! She rated a 5 plus in our book! Great voice and personality. We loved her eclectic music choices. The food was ok, the cruise was ok. Victoria made the cruise a 5. I really enjoyed every minute of my dinner cruise. We had a fantastic time. Relaxing, great food, service and live music. Highly recommend. Worth it for the pictures alone. Food and drink fine. Best if you can get a window seat during the meal but plenty time to get out and about later. A unique experience. Wouldn't have missed it. Very enjoyable and relaxing.